When the Garmin HRM Run strap that came with our fenix 5 watch finally failed, we went back to the first heart rate strap that we’d ever worn and it reminded us how nice it is to have something that feels good, and works. Here are a few of the reasons we’re happy to have returned to Wahoo. Soft, velvety elastic strap that is snug without being too tight. Front snap closure. Know how cool front closure bras are? How easy they are to open and close? 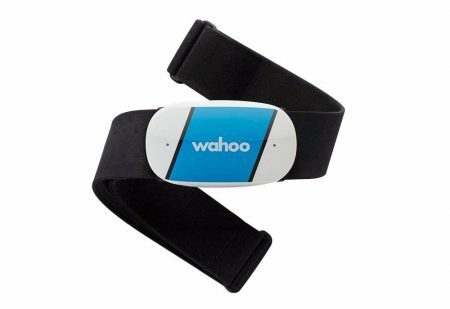 That’s how nice it is using Wahoo’s front snap closure. It connects the circuit and straps it up all at once. No fiddling with a side clip and then sliding into place. No label that’s constantly folded over and scratching up your ribs. Bluetooth and ANT+ connectivity. This HRM will connect to nearly everything — watches, phones, bike computers…and really what else is there. Use it on the bike with a Garmin 520 for a ride and then pair it up with a smartphone for jogs and hikes. It really is that easy. Flashing lights to let you know it’s on. This may not seem that important but once something goes wrong it can be difficult to figure out who is to blame in the Bluetooth or ANT+ circle jerk. When the battery is dead the lights won’t flash. Duh. Simple but effective. Price. Who can complain about $50 bucks. Sure, it doesn’t have built in stride metrics, but who runs anyway and if you do, well, maybe you need a different strap. If you’d like to join us in HRM heart rate strap comfort, click the link and grab one for yourself.